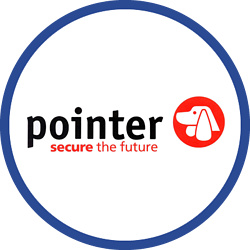 Based in Glasgow, Pointer Ltd specialises in the design, installation, service, maintenance, training and monitoring of electronic security and fire systems. importance of managing risk to their stock, reputation, staff, premises and key data. In July 2014, Pointer was visited by its mobile, voice and data connectivity providers, HighNet, a certified partner for Crystal Ball solutions. During the meeting and demonstration of the range of mobile solutions on offer, Graeme Davison the General Manager at Pointers, 24 hr monitoring centre, drew attention to an existing Lone Worker project. Graeme discussed that due to the nature of the business, engineers were working in isolated areas, occasionally out of hours and with no existing solution in place to monitor their safety and welfare - other than inefficiently sending two engineers on a visit at a time. A secondary requirement for Pointer was to be able to monitor their engineers’ locations when outside of their vehicles to improve real-time visibility for the operations team. Graeme therefore believed it was important to address both of these matters particularly when his engineers work in remote locations. Tony Miller, Account Development Manager at HighNet, listened to Graeme’s concerns and felt Crystal Ball’s MobileLWP and MobileTrack Pro would be an ideal fit for his requirements. After considering several other Lone Worker Protection suppliers, Pointer decided to implement Crystal Ball’s MobileLWP and MobileTrack Pro on a trial basis initially. With MobileLWP in situ across the engineers’ smartphones, Pointer can now monitor their welfare and safety 24/7 at its control centre. With the manual panic alarm functionality, engineers can now raise an alarm if necessary and alert appropriate members of staff. Additionally, when an employee initiates a new session a countdown timer is activated. When the timer expires the engineer is then prompted to check in. Failure to do so triggers an automated panic alarm which is sent directly to the management at Pointer. Combined with MobileTrack Pro, Pointer can now rest assured that when their engineers leave their vehicles and continue to their jobs on foot, the smartphone application will continue to monitor their locations in real time, and this can be displayed via the Crystal Ball web portal on a detailed mapping system. Since implementing Crystal Ball, Pointer now has complete visibility of its engineers 24/7 when in vehicle and on foot and can pin point within a few yards their location thanks to MobileTrack Pro. With MobileLWP Pointer can also now guarantee that its engineers’ welfare is monitored which in turn has addressed the relevant health and safety legislation. "Everything Crystal Ball does, it does over and above what I was expecting. It ticks all the boxes and is a better solution all round."